- CAD slides as BoC survey shows growth falling, inflation cooling. - RBC says BoS vindicates interest rate u-turn from Bank of Canada. - CIBC reiterates no more rate hikes from BoC, forecasts weaker CAD. The Canadian Dollar weakened Monday after the latest business outlook survey from the Bank of Canada (BoC) revealed a weakening of inflation pressures in the first-quarter and also pointed to slower growth in the months ahead. Canada's Dollar ceded ground to all of its rivals Monday after many of the indicators contained in the latest business outlook survey fell to their lowest levels since the third quarter of 2016. The survey vindicates the Bank of Canada for not having raised its interest rate thus far in 2019. "The main headwinds are a more uncertain outlook in the Western Canadian energy sector, continued weakness in housing-related activity in some regions, and tangible impacts from global trade tensions," the BoC says. The sales growth indicator pointed clearly in the first quarter toward the weakest revenue growth for companies since the July-October period of 2016, while investment and hiring intentions both fell too, albeit that the latter still remain at elevated levels. Most importantly, respondents to the survey told the Bank of Canada they anticipate that input and output price growth will "stabilize" over the coming months due to a combination of increased competition and fading pressure from tariff-related cost increases, which are offsetting higher commodity prices. This means lesser inflation pressures up ahead, which is not good for the Loonie because it would take a robust outlook for consumer price growth to get the Bank of Canada to lift its interest rate this year. Economists are now speculating the BoC will sit on hold for at least the foreseeable future. "The Bank of Canada has already made a quick move to the sidelines in terms of further interest rate hikes in recent months with global growth concerns, benign inflation trends, and slower household credit/spending growth offsetting persistent capacity pressures. The easing in indications of the latter only reinforces that move and increases the odds that the next Bank of Canada interest rate hike is a lot further away than thought just a few months ago," says Nathan Janzen of RBC Capital Markets. Above: Approximate Canadian sales growth on a trailing 12-month basis. Monday's readings reflect feedback on the economic outlook obtained from 100 of Canada's largest companies during a quarter that was marked by volatility in oil markets and rising concerns over the outlook for the global economy, with many advanced economies having slowed clearly during recent months. In March, the BoC stopped just short of saying it doesn't expect to raise rates at all this year. This was after a December-to-January u-turn on earlier interest rate guidance that had suggested it could lift its cash rate on as many as three occasions in 2019 and potentially taking it from the current 1.75%, up to 2.5%. 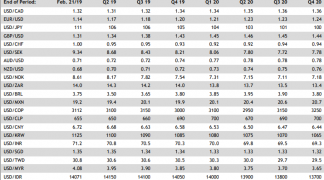 However, a final quarter 2018 bust in the oil market took place around the same time that fears for the global growth outlook were really beginning to pick up. Both Chinese and Eurozone economies slowed sharply in the latter half of 2018 due mainly to President Donald Trump's trade war with China. 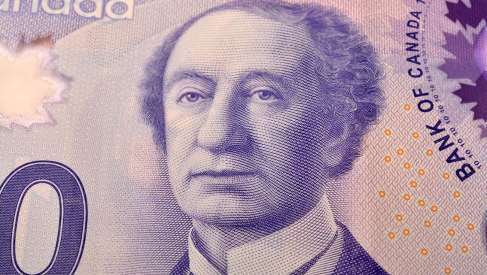 That bust was enough to throw the Bank of Canada off its earlier course and ever since then doubts over whether it will even get the opportunity to raise rates again in this cycle have proliferated among analysts and economists. "The Bank makes most use of this survey for its colour on inflation, and all of the various measures showed an easing of price and cost pressures vs. the prior report. Look for the upcoming MPR to translate that into a modest opening up in the output gap, giving the Bank license to keep rates on hold this year," ," says Avery Shenfeld, chief economist at CIBC Capital Markets. Shenfeld and the CIBC team say they never were convinced that either of the North American central banks would lift rates again this year. However, now the Federal Reserve has come close to calling off its interest rate hiking cycle, they're growing even more confident in their call that the BoC won't hike again. An increasing number of developed world central banks have moved to the sidelines of the monetary policy field during recent months including the U.S. Fed, Reserve Bank of Australia and Reserve Bank of New Zealand. And the European Central Bank kicked the idea of a rate hike out into the long grass of 2020 while the Bank of England has been derailed from its rate hike path by the ongoing Brexit farce in the UK parliament. All of the currencies relevant to the above-referenced central banks have already depreciated relative to the Canadian Dollar this year, other than Pound Sterling, so if the Bank of Canada was to suggest later in 2019 that its own interest rate may already have gone as high as it's likely to, there could be a violent response from the Loonie. "Even with the BoC on hold, an expected rebound in Q2 for the Canadian economy should lend support to the loonie in the near-term, allowing it to ride the coattails of other currencies gaining on the greenback. Look for a mid-year low for USDCAD in the 1.31 range," Shenfeld writes, in CIBC's latest monthly FX outlook. 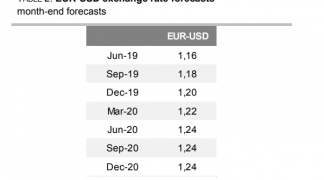 Shenfeld and the CIBC team forecast the USD/CAD rate will reach a low of 1.31 in June before rising to 1.34 in time for year-end, as the Canadian Dollar weakens in response to a renewed slowdown in the economy and a BoC acknowledgement that its hiking cycle is at an end. 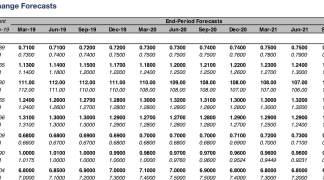 They project more weakness in 2020 that should spill over into the subsequent year, ultimately placing the USD/CAD rate all the way up at 1.40 in time for the end of 2021. The Pound-to-Canadian-Dollar rate, on the other hand, is projected to rise in 2019 as the Brexit process edges closer toward an end. That is expected to result in a broad but gradual recovery of Sterling that drives the Pound-to-Loonie rate from 1.75 Monday to 1.82 by year-end. Above: Pound-to-Canadian-Dollar rate shown at daily intervals. The Pound-to-Canadian-Dollar rate is condemned to trade within a narrow range over the coming week, according to technical analysts at Scotiabank, although the outlook for the USD/CAD rate appears to be dividing forecasters and strategists. The Canadian Dollar weakened against rivals Wednesday after the Bank of Canada (BoC) abandoned the so-called 'tightening bias' that would have eventually seen it go on lifting interest rates over the coming quarters, before laying the foundations for a possible shift to an 'easing bias' at a later date. 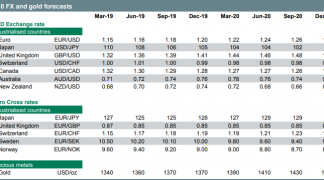 The Canadian Dollar remains the best performing currency in the G10 universe for 2019 but that could all change this week if analyst commentary on the Loonie is anything to go by, given many are warning clients that losses are looming on the path ahead. The Pound is looking marginally bearish against the Canadian Dollar from a technical perspective, leading us to expect declines over coming days.